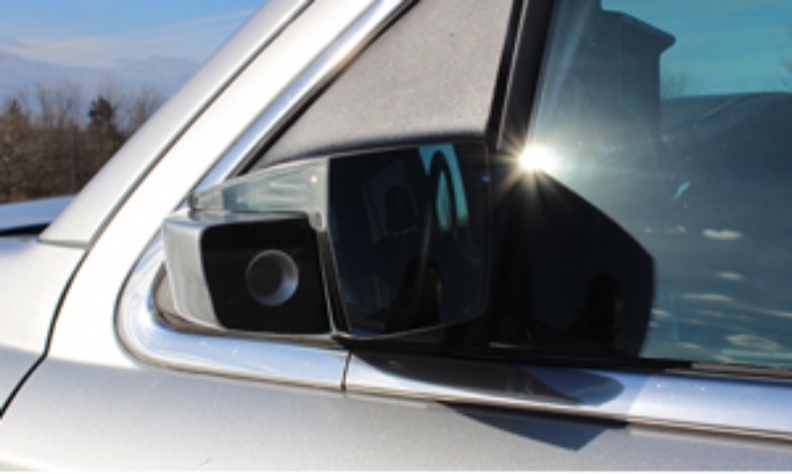 The exterior sideview mirror combines a self-cleaning camera with a traditional sideview mirror to display a live video feed inside the vehicle. Magna International has developed a pair of camera-equipped mirrors that allow drivers to see video of their surroundings as they drive. It’s the latest development in the Canadian auto parts maker’s effort to gain a stronger foothold in the onboard camera market. The camera is mounted on the mirror beyond the widest point of the vehicle “to achieve a maximum field of view, enhance the driver's awareness and improve safety,” the company said in a statement. The new hybrid mirror can also come equipped with turn signals, ground illumination and surround-view cameras. The interior mirror features the ability to switch between a traditional rearview mirror mounted on the windshield and a full-size video display on the infotainment screen. The video comes from a live feed from a camera mounted at the back of a vehicle and provides an unobstructed view of what's behind. It’s designed to help drivers when passengers or cargo inside the vehicle restrict the driver's view using the traditional rearview mirror. Magna previously told Automotive News Canada that it sees onboard cameras as a significant segment for growth in the automotive supply chain. It has been supplying automakers with cameras for about a decade but projects it to be an increasingly bigger piece of its business as autonomous vehicles gain acceptance and eventually government approval. Magna Electronics Vice-President Joel Gibson said in March that the total market value for camera-based driver assistance systems is “growing very quickly” and he expects it to be worth about US $10 billion per year by 2020. Magna CEO Don Walker said in February at the Automotive News Canada Congress in Toronto that the company generates US $450 million annually in all electronic components and plans to grow that to US$1 billion.